Ecocars : Hybrid, electric or ecoventional ? Yellow Jersey = Its Tour of Britain time! Surf YouTube or Vimeo and you’ll find an enormous amount of in car footage and headcam action of motor racing, snowboarding, mountainbiking, and just about anything that moves. Today this has become affordable to the masses and is no longer the realm of just TopGear type TV programmes. We decided to have a look at the latest offering in the market; the ContourHD from www.vholdr.com, which sports a 1280×720 HD format and an impressively wide 135º lens. Ideal for recording your trackday session, superbike blast or even your trampoline flips! We bought ours from www.actioncameras.co.uk for 330 UKPounds including an extra 16GB micro-SD card. As our intention is to film car reviews with it, that’s the first test we put it to. Open the neat package and there’s not a lot in there. 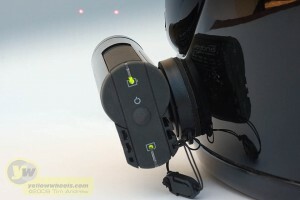 Ours came with a helmet and goggle mount, USB cable, battery, 2GB micro-SD card, and minimalist manual. So where’s the charger, software CD, doorstop manual ? To charge: just plug the mini-USB lead into the camera, behind the protective slide-up back rubber cover, and then the other end into your computer. The camera then just works like a USB stick. Handily you can also charge it via an ordinary cigar-lighter mobile phone charger as long as it has a mini-USB outlet, but this is not included. 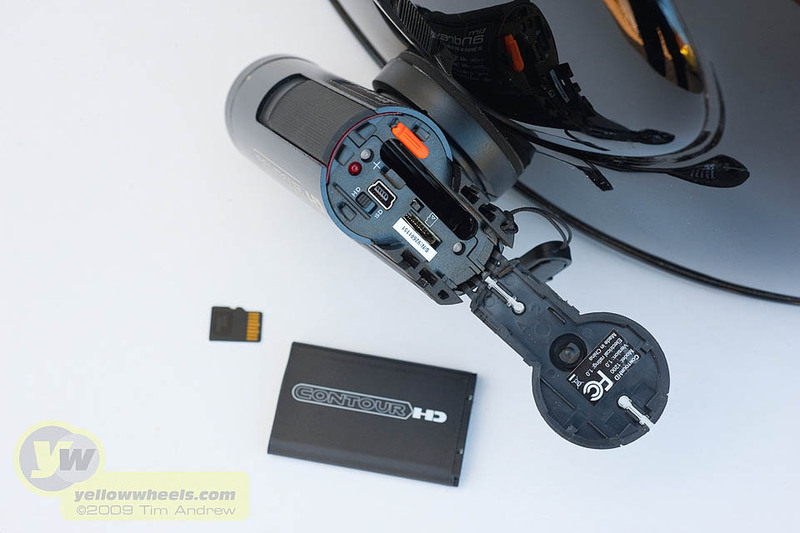 There are other mounts available for bike handlebars, vented helmets, roll cages, but none that we could find for a standard tripod thread which seems like an omission. To start up this baby, just hold the rubber back button till it beeps at you. Don’t be alarmed by the cyborg-like lasers that instantly light up, they won’t zap the neighbours but let you adjust the horizon of the lens. Rotate the end of the lens barrel so the two laser spots are level; clever stuff this! Then you just slide the glove friendly record button forward, and that’s it. Really simple, well thought out design. There’s very little to know otherwise – no wonder the manual is so brief. Within minutes we’d dreamed up a couple of extra mounting possibilities. An old Nikon flash shoe foot with tripod thread was drilled. The spare plastic mount, that is actually part of the packaging, was bolted onto it. Usefully this makes a flat surface mount, which you could gaffer tape onto practically anything too. Then to wear the camera on glasses we used the goggle mount with a couple of old batteries gaffer taped up and rubber-banded as a counterweight. 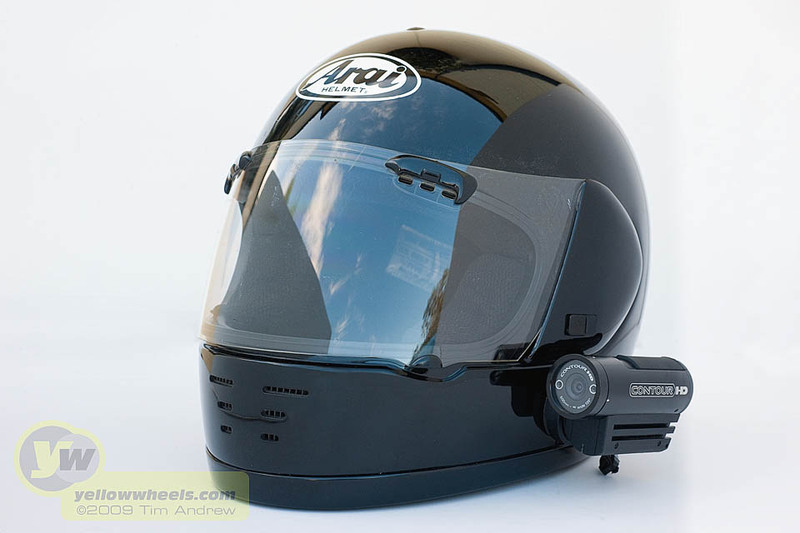 Useful for walkaround and driver’s view footage, but at the price of looking like a dork ! 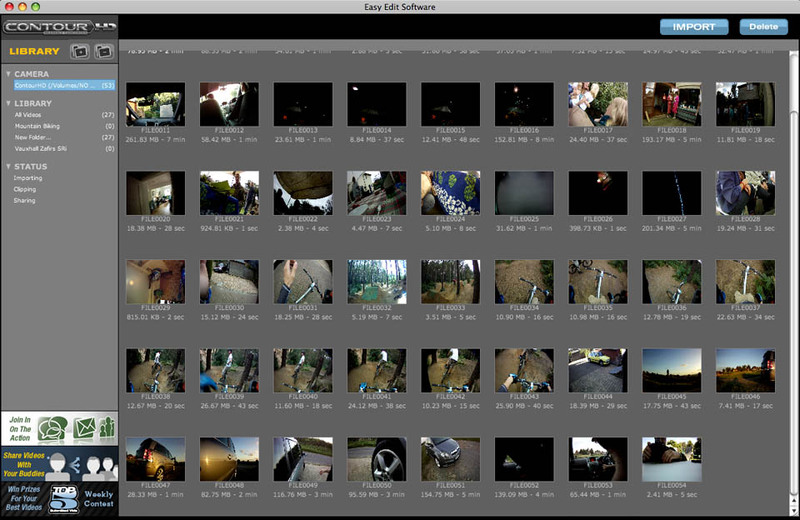 Filming the car was straight forward with several runs up and down a local road to edit different views together. The light was low evening sun, which proved challenging, as our new toy tended to underexpose most shots. We ended up with footage that was quite dark, even from within the car where large tracts of dark fabric and trim would normally fool a camera into lightening up the exterior too much. There is no way of overcoming this. We would recommend the manufacturers fit a simple slider switch, hidden behind the back rubber cover that allowed basic three position exposure compensation. When suction mounted to the side of the bodywork exposure was better, and the footage was good even on very bumpy country roads. Tripod mounted and pan shots proved to be jerky, not the camera’s forte and not what it was designed for. 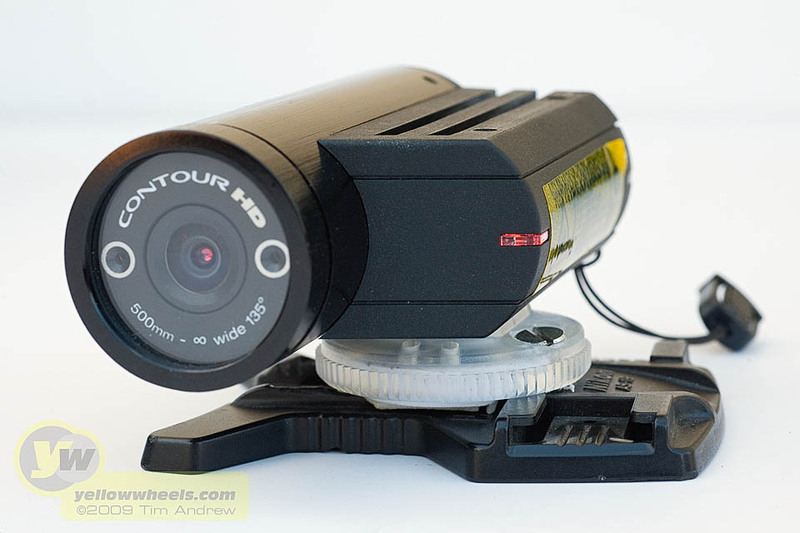 ContourHD review from yellowwheels on Vimeo. For a camera that’s designed to be whistling through the air, we were disappointed by the high wind noise. After a bit of research on vholdr.com’s user forum we found someone who had added a small bit of foam INSIDE the camera body, wrapped around the microphone. We are tempted to copy this, but at the risk of invalidating the guarantee. Braver still, is the idea of wiring in a plug for an external mic. Then just tape it inside your helmet for a cleaner commentary or inside your engine bay for some aural assaults. Small solid state HD camcorders can be yours for not much more than the ContourHD, but all lack the essential ultra-wide-angle lens of the ContourHD, with its full 135º of coverage. You have to buy the non-HD GoPro Wide camera to beat that with 170º. The lack of any means of checking your composition or footage is a bit disconcerting, but at the same time, the lens is so wide that you’ll rarely miss anything, and if there’s a handy computer, you just USB it in, double-click on the latest file and you can watch your footage without even downloading it to your computer. One caveat though: you’ll need a pretty recent and powerful computer to watch the HD footage without annoying judder. In general, if your computer is more than a couple of years old, forget it and stick to non-HD headcams ! You can register your camera with vholdr.com to upload your masterpieces via the free Easy Edit Software for PC and Mac. It’s equally simple to use editing and uploading software, with only the possibility of importing, setting the start and finishing point of your video, basic title, description and keywords. After all this testing, we admit that we didn’t get around to trying the SD (as opposed to HD) quality which gives you a 60 frame per second frame rate at the lower 848×480 resolution. (watch this space for an update) Normal HD is 1280×70 at 30 fps, with a 30min per GB file size. The battery is rated as good for 1 hour of HD so the supplied 2GB card is well matched. We picked up a 16GB card as well, as we already had a car charger: good for 8 hours of filming! The camera automatically powers down after 15mins of inactivity, so remember to switch it back on when that trackday session has been held up unexpectedly. Below is a more typical use for a headcam: mountain bike dirt jumping at which this camera excels. This was shot in fairly low light, but low contrast amongst the trees without low sun is a much easier task for the CCD to record. It’s a very easy camera to use, well thought out, light, pocket-able, and difficult to get wrong when in situations where too many buttons and controls might jeopardise your important footage, and for those reasons alone you’ll find yourself using it regularly. We were a little disappointed with the wind noise, underexposure, lens edge optical quality. But overall would recommend it. 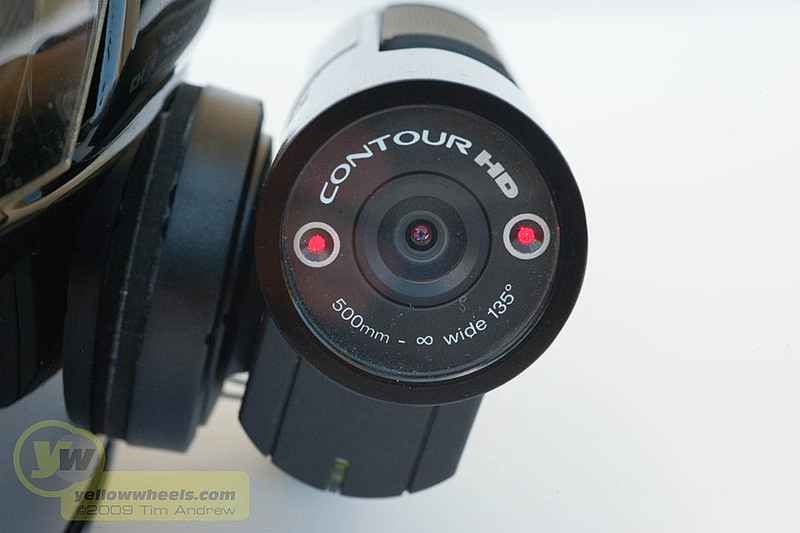 I own a ContourHD and love it! Three weeks ago they released not only a threaded tripod mount, but a whole series of auto mounts; you may want to adjust your review tiny bit.